Next month US series Suits is set to screen express from the US for the first time in Australia on its new home, Universal Channel. It will air on the same day as the US premiere. Season 4 is currently screening Tuesday nights at 8:30pm. 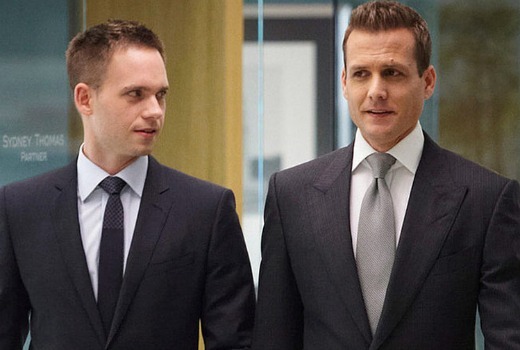 Gabriel Macht and Patrick J. Adams return as Harvey Specter and Michael Ross when this hit series returns for its fifth season, First on Foxtel and Express from the U.S for the first time for Australian audiences. Since hiring Mike on the spot after seeing his gifted mind and photographic memory in action, Harvey and Mike have have closed cases and tried to navigate the treacherous waters of the legal world without letting it slip that Mike doesn’t have a degree. Along the way, they have enjoyed personal triumphs, suffered heart breaking losses and built a surrogate family with their closest confidants at the firm. Episodes 11 and 12 are now on iTunes Australia. Pity this didn’t happen before the show took a complete nose-dive creatively. Yes, Mike going back to Pearson Spectre made no sense. It was written just to drag out the whole Mike has a fake degree thing one more time because they had no idea of where else to go. I just flipped over to Universal to catch eps 9 & 10 again (it’s been so long, I needed a refresher). When Louis Litt (Rick Hoffman) let loose on Jessica towards the end, it was spine-chilling again. I don’t think I’ve come across an actor so suited to a particular role since maybe Michael Richards to Kramer. iTunes has been pushing Suits a bit recently. I wonder if they will have each episode available the day after they air on the Universal channel? Maybe on google play and quickflix too. Universal is on Fetch TV too. So maybe there are some options to explore for those who don’t want Foxtel or to wait for DVDs/Seven. I watch Suits, but it is not one of my top shows that would entice me to subscribe. It will turn up somewhere. Noooooooooo, why does this keep happening? All the shows I get invested in keep going to Foxtel. They need to realise, not everyone has Foxtel. They did it to The Americans, Damages, Pretty Little Liars & now Suits. Just hope ch 7 shows it after it’s aired on Foxtel. Not to sound like a door-to-door salesman – or worse, one of those life insurance ads – but given all the shows you have just mentioned are available on Foxtel channels which are included in the Essentials and Drama packs, that means you would only have to pay $45/month for regular Foxtel or $35 for Foxtel Play. If I was to put it like those awful funeral ads, ‘that’s as little as your weekly takeout’. But, I’m realistic and realise a lot of people simply cannot afford that and that’s why they need FTA. But with Foxtel airing them quicker than FTA it does allow for DVD releases to speed up which means instead of spending 4 months on subscriptions to see a single series you could spend one months worth on the DVD. Just food for thought. Thanks for all the info, but am currently unemployed so it’s way beyond my means at the moment. Has channel 7 aired season 4 episodes 11 – 16? I hope I didn’t miss them. Also, Netflix has first 3 seasons. Would anyone know if they’ll pick up season 4 (and 5) and what kind of timeframe? Or would I have to wait for channel 7 to show them first? Sorry for all the questions, but Suits is one of my favourite shows. I’ve started rewatching it on Netflix, even though I have a million things on my pvr to watch. This makes me sooo happy. When I saw an ad on Universal a month ago saying they were playing double episodes so they could fast track the second part of the season I nearly didn’t believe it. This definitely sticks it to Seven for slow tracking series so they have new content to air over Summer. And with Seven cancelling their output deal with NBCUniversal 2 years ago this means Universal has more power to obtain first run rights. Now they just need the last season of Covert Affairs, and new seasons of Royal Pains and I’ll be in heaven. Seven cancelling their NBCUniversal prompted them to start their own Foxtel channel for their shows, instead of selling cheap nonexclusive rights piecemeal to other Foxtel channels. Seven presumably could have retained first run rights to Suits like they did for S3 and S4a, as long as they continued to pay for them, and like Ten did with Monk, Psych, In Plain Sight after they dropped the NBCU output deal (which allowed Seven to pick it up). So Universal are showing double eps of S4 on Tuesdays to catch up before S5 starts. Next week they are up to #4.11 Enough is Enough. (Seven stopped showing suits after the first block of season 4 with #4.10 This is Rome). Does this mean that Seven will not screen the show ? Whilst the wording indicated ‘exclusive home’ I suspect Seven still has a second window later. If Seven has sold the exclusive first run rights back to Universal they may have retained rights to show them later. If they have sold or let go of all the rights then the question is why would they bother to buy them after Universal has shown them and the DVDs are out? Networks are only getting one or two hundred thousand viewers with few under 50s for late night slots and having trouble selling ads in them. There are often only 1 or 2 paid ads in ad breaks. “Exclusive home” sounds like the only place to watch. But that could apply only to new eps. Seven won’t say so we will find out in a year if they have aired the rest of S4 or not. Another series to watch on DVD when released I guess. I guess with the low numbers, which is in turn because of the late hour it was screened mostly after 11 pm, and sometimes not commencing until 11.45, it would not warrant spending too much money on the show. shame because it is really good. At least TEN screen The God Wife at 9.30. Season 4 gets released on DVD June 8th 2015 in UK. Late Night TV just doesn’t rate anymore. The Good Wife gets a bit better numbers starting somewhere between 9:30pm and 10pm. But they still wouldn’t be good enough to keep 7 or 9 happy.